Courtesy The Purdue Varsity Glee Club will perform today on the Purdue University Fort Wayne campus. 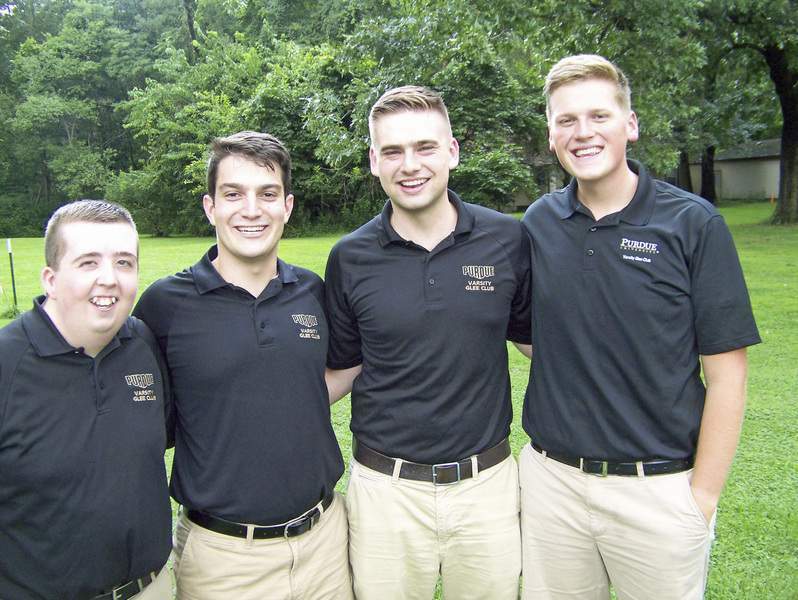 Area members are Sam Simpson, left, Stephen Wirtner, Micah Reynolds and Zach Bucher. TODAY – Carol Lockridge – 6:30 p.m.; The Venice, 2242 Goshen Road; 482-1618. SATURDAY – Chad Sparkman, Matt & Jason Band – 7 p.m.; Cupbearer Cafe, 138 E. Seventh St., Auburn; no cover; 260-920-8734. SATURDAY – “The Rach 2,” Lise de la Salle and Fort Wayne Philharmonic – 7:30 p.m.; Embassy Theatre, 125 W. Jefferson Blvd. ; 260-481-0777, Philharmonic box office or FWPhil.org. SUNDAY – Trine University Choir and Chamber Orchestra – 3 p.m.; Ryan Concert Hall, T. Furth Center for Performing Arts, Ryan Concert Hall, 1 University Ave., Angola; free. SUNDAY – “Halloween Spookacular,” Fort Wayne Philharmonic – 2 p.m.; Auer Performance Hall, PFW, 2101 E. Coliseum Blvd. ; 260-481-0777, Philharmonic box office or FWPhil.org. SUNDAY – “New Beginnings: Reflections of War and Peace,” Fort Wayne Philharmonic Youth Symphony Orchestra – 5:30 p.m.; Auer Performance Hall, Purdue Fort Wayne, 2101 E. Coliseum Blvd. ; $5 adults, free for children; 260-481-0777, Philharmonic box office or FWPhil.org. TUESDAY – Purdue Fort Wayne Community Orchestra – 7:30 p.m.; Auer Performance Hall; Purdue Fort Wayne, 2101 E. Coliseum Blvd. ; $7 adults, $6 seniors, $4 non-PFW students, free for PFW students; 481-6555 or www.pfw.edu/tickets. TODAY – Hubie Ashcraft and Travis Gow – 8 p.m.; Pat & Larry's Bar and Grill, 22227 Main St., Woodburn; no cover; 632-4017. SATURDAY – John Curran and Renegade – 9:30 p.m.; Taps Pub, 104 Green Drive, Avilla; no cover; 260-897-3331. SATURDAY – The Hubie Ashcraft Band – 7 p.m.; Flashback Live, 4201 N. Wells St.; $5 cover; 422-5292. WEDNESDAY – Francie Zucco Jazz Trio – 6 p.m.; Don Hall's Triangle Park, 3010 Trier Road; 482-4342. THURSDAY – Opera Ensemble – 7:30 p.m.; Rhinehart Recital Hall, Purdue Fort Wayne, 2101 E. Coliseum Blvd. ; $7 adults, $6 seniors, $4 non-PFW students, free for PFW students; 481-6555 or www.pfw.edu/tickets. TODAY – The Gypsy Bandit Band – 8 p.m.; American Legion Post 241, 7605 Bluffton Road; no cover; 747-7851. SATURDAY – The Hit Men – 7:30 p.m.; Honeywell Center, 275 W. Market St., Wabash; 260-563-1102 or www.honeywellcenter.org. TODAY – Machine Head – 8:30 p.m.; Clyde Theatre, 1808 Bluffton Road; ClydeTheatre.com. TODAY – Chris Worth & Co. – 9 p.m.; Arena Bar & Grill, 1567 W. Dupont Road; no cover; 489-0840. TODAY – Joe Justice – 5 p.m.; Byler Lane Winery, 5858 County Road 35, Auburn; no cover; 260-920-4377. TODAY – Martin Barre Band – 8 p.m.; C2G Music Hall, 323 W. Baker St.; tickets start at $30; 426-6434 or www.c2gmusichall.com. TODAY – Purdue Varsity Glee Club – 7 p.m.; Rhinehart Music Center; Purdue Fort Wayne, 2101 E. Coliseum Blvd. ; $25 adults, $10 students; www.pfw.edu/tickets. TODAY – Scratch n Sniff 2.0 with 1/4 Kit Kurt – 8 p.m.; Deer Park Irish Pub, 1530 Leesburg Road; no cover; 432-8966. TODAY AND SATURDAY – He Said She Said – 9:30 p.m.; The Post, 136 N. First St., Pierceton; cover; 574-594-3010. SATURDAY – An Evening With Eric Johnson – 8 p.m.; Clyde Theatre, 1808 Bluffton Road; ClydeTheatre.com. SATURDAY – The Dee Bees – 7 p.m.; Don Hall's Triangle Park, 3010 Trier Road; 482-4342. SATURDAY – Dailey & Vincent – 7:30 p.m.; Niswonger Performing Arts Center, 10700 Ohio 118, Van Wert, Ohio; 419-238-6722 or NPACVW.org. SATURDAY – Twiztid – 6:30 p.m.; Piere's Entertainment Center, 5629 St. Joe Road; $25. SATURDAY – Chris Worth & Co. – 8 p.m.; American Legion Post 47, 601 Reed Road; no cover; 209-3960. SUNDAY – Matt Maher and Zach Williams – 6 p.m.; Memorial Coliseum, 4000 Parnell Ave.; tickets start at $28 general admission, $8 children; 482-9502 or ticketmaster.com. MONDAY – Scratch n Sniff 2.0 with 1/4 Kit Kurt – 8 p.m.; Deer Park Irish Pub, 1530 Leesburg Road; no cover; 432-8966. MONDAY – Little Steven and the Disciples of Soul – 7:30 p.m.; Honeywell Center, 275 W. Market St., Wabash; tickets start at $25; 260-563-1102 or www.honeywellcenter.org. MONDAY – “Bach and Beer,” Bach Collegium – 6 p.m.; Hop River Brewing Co., 1515 N. Harrison St.; bachcollegium.org. WEDNESDAY – Gov't Mule – 8 p.m.; Clyde Theatre, 1808 Bluffton Road; $32.50 advance, $37.50 day of show; Clyde box office, 800-514-3849 and ClydeTheatre.com. WEDNESDAY – Joe Justice – 2 p.m.; Sacred Heart Home Halloween Party, 515 N. Main St., Avilla; no cover; 260-897-2841. WEDNESDAY – Jason Paul – 7 p.m.; 469 Sports and Spirits, 1322 Minnich Road, New Haven; no cover; 749-7207. THURSDAY – David Sanborn Electric Band – 8 p.m.; Clyde Theatre, 1808 Bluffton Road; tickets start at $45; Clyde box office, 800-514-3849 and ClydeTheatre.com. CeCe Winans with Christiana Danielle: 7 p.m. Dec. 15; Clyde Theatre, 1808 Bluffton Road; tickets start at $39; Clyde box office, 1-800-514-3849 and ClydeTheatre.com. “The Elvis Tribune Artist Spectacular”: 3 p.m. Jan. 20; Honeywell Center, 275 W. Market St., Wabash; tickets start at $39; 260-563-1102 or www.honeywellcenter.org. “Celtic Woman: Ancient Land”: 7:30 p.m. April 13; Honeywell Center, 275 W. Market St., Wabash; tickets start at $45; 260-563-1102 or www.honeywellcenter.org. Carl Palmer's ELP Legacy: 7:30 p.m. Nov. 3; Clyde Theatre, 1808 Bluffton Road; tickets start at $25; Clyde box office, 800-514-3849 and ClydeTheatre.com. Amy Grant: 7:30 p.m. Nov. 9; Niswonger Performing Arts Center, 10700 Ohio 118, Van Wert, Ohio; 419-238-6722 or NPACVW.org. Brothers Osborne: 7:30 p.m. Nov. 10; Clyde Theatre, 1808 Bluffton Road; $27.50 advance, $32.50 day of show; Clyde box office, 1-800-514-3849 and ClydeTheatre.com. Jeremy Camp and Matthew West: 7 p.m. Nov. 15; Memorial Coliseum, 4000 Parnell Ave.; 482-9502 or ticketmaster.com. “The Ghosts of Christmas Eve,” Trans-Siberian Orchestra: 7:30 p.m. Nov. 15; Memorial Coliseum, 4000 Parnell Ave.; tickets start at $39.50; 482-9502 or ticketmaster.com. Tower of Power: 8 p.m. Nov. 16; Clyde Theatre, 1808 Bluffton Road; tickets start at $39; Clyde box office, 1-800-514-3849 and ClydeTheatre.com. “Paw Patrol Live: Race to the Rescue”: 10 a.m. Nov. 24 and 25, 2 p.m. Nov. 24; Memorial Coliseum, 4000 Parnell Ave.; tickets start at $24.50; 482-9502 or ticketmaster.com. Tech N9ne: 7 p.m. Nov. 27; Clyde Theatre, 1808 Bluffton Road; $30 advance, $35 day of show; Clyde box office, 1-800-514-3849 and ClydeTheatre.com. Here Come the Mummies: 7:30 p.m. Nov. 30; Clyde Theatre, 1808 Bluffton Road; $22.50 advance, $25 day of show; Clyde box office, 1-800-514-3849 and ClydeTheatre.com. Jackyl: 7:30 p.m. Dec. 6; Clyde Theatre, 1808 Bluffton Road; $20 advance, $25 day of show; Clyde box office, 1-800-514-3849 and ClydeTheatre.com. Hairball: 8 p.m. Dec. 14; Clyde Theatre, 1808 Bluffton Road; $17.50 advance, $22.50 day of show; Clyde box office, 1-800-514-3849 and ClydeTheatre.com. “Messiah,” Fort Wayne Philharmonic and Steuben County Festival Choir: 2 p.m. Dec. 16; T. Furth Center for Performing Arts, Ryan Concert Hall, 1 University Ave., Angola; $10; trine.edu/furth. Big Bad Voodoo Daddy: 7:30 p.m. Dec. 16; Clyde Theatre, 1808 Bluffton Road; tickets start at $29; Clyde box office, 1-800-514-3849 and ClydeTheatre.com. Bob Seger & The Silver Bullet Band: Jan. 15; Memorial Coliseum, 4000 Parnell Ave.; 482-9502 or ticketmaster.com. Jame Shimabukuro with Fort Wayne Philharmonic: 7:30 p.m. Jan. 26; Embassy Theatre, 125 W. Jefferson Blvd. ; 260-481-0777, Philharmonic box office or FWPhil.org. Pop Evil: 8 p.m. Feb. 8; Clyde Theatre, 1808 Bluffton Road; $19 advance, $23 day of show; Clyde box office, 1-800-514-3849 and ClydeTheatre.com. John Mellencamp: Feb. 12; Embassy Theatre, 125 W. Jefferson Blvd. ; 1-800-745-3000 or www.ticketmaster.com. Badfish: 7:30 p.m. Feb. 15; Clyde Theatre, 1808 Bluffton Road; $15 advance, $18 day of show; Clyde box office, 1-800-514-3849 and ClydeTheatre.com. Old Dominion: Feb. 16; Memorial Coliseum, 4000 Parnell Ave.; 482-9502 or ticketmaster.com. Umphrey's McGhee with Moser Woods: 7:15 p.m. Feb. 21; $32.50 advance, $35 day of show; Clyde Theatre, 1808 Bluffton Road; Clyde box office, 1-800-514-3849 and ClydeTheatre.com. Shinedown: March 7; Memorial Coliseum, 4000 Parnell Ave.; 482-9502 or ticketmaster.com. Winter Jam: March 28; Memorial Coliseum, 4000 Parnell Ave.; $15 at the door. Bach in the Barn: Fort Wayne Philharmonic; 7:30 p.m. May 1 to 3; Joseph Decuis Farm, Roanoke; 481-0777, Philharmonic box office or FWPhil.org. Paul McCartney: June 3; Memorial Coliseum, 4000 Parnell Ave.; 1-800-745-3000 or ticketmaster.com.